After all the hype, promises, and experimentation for decades, it looks as if interactive television is growing to become a $20 billion dollar venture. However, did you know that the concept of interactive television is almost as old as television itself? The history of videogames, which is a form of interactive television, is directly related to interaction with a television or monitor. How did it all start? Many are familiar with Ralph Baers' work and the notorious brown box. Perhaps the story you are not familiar with is that of Winky Dink. When the Odyssey console was released, it came packaged with a series of plastic acetate overlays that were designed to be placed over your television screen. The overlays simulated color and board graphics, something technology couldn't then produce, despite the Odyssey being state of the art at the time. Is this the first use of plastic overlays and interactive television? Many believe that it is, but that, my good friend, is a fallacy! Enter Winky Dink, a cute loveable pixie character with a star-shaped hairdo voiced by Mae Questel, also the voice of Betty Boop. 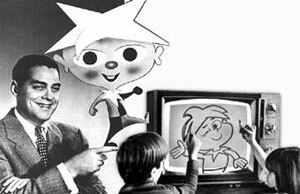 CBS premiered Winky Dink, and his pals Mysto the Magician, Mike McBean, Dusty Dan, and Winky's dog Woofer on the hit show "Winky Dink and You" on Saturday October 10th, 1953 at 10am. Winky would often get in over his head, and it was up to the viewer to pull out their handy 50 cent "Official Winky Dink Kit" and apply a thin sheet of acetate known as the 'Magic Window' over the television screen. Also included in the kit were cleanup cloths and crayons. Kids interacting with the show would be asked to draw ropes, bridges and other props to help Winky escape out of trouble, under the direction of the host, Jack Barry. The kit sales were phenomenal - well over 2 million units were sold. It is believed that most mothers purchased them in a state of panic simply to keep their children from destroying their television sets, which were incredibly expensive at the time. It is certain that many TVs were ruined by youngsters eager to participate without an official kit by scribbling on the television sets with crayons or markers, and no protective acetate! The original run was over four years. Winky also returned in 1969 via syndication with 64 all-new episodes and, of course, a new kit. Thankfully, we are no longer using plastic acetate as an input device for interactivity with our televisions. However, we should never forget Winky, and all that he did for us!